Hamilton has arrived at Shea’s Buffalo in a stunning production that is seamless and riveting from start to finish. It is a magical night of theater, transporting us back in time while maintaining a very modern sensibility throughout, and transforming the high-school-history-book Founding Fathers from stodgy old men into the cocky, arrogant young blades they surely were, whose ideals while real, were also often informed by unbridled self-interest. Hamilton truly is both a “revolution” and a “revelation." It is a revolution in the total color-blindness of the casting, the beauty of which is that it feels completely natural, and in the infusion of hip-hop, reggae, and pop music that brings 18th century history into the 21st century, fueled by the individual stories of those involved in the founding of the nation. It is a revelation in its use of human bodies and a minimum number of props to create moods and entire scenes. The trend toward “Disney-fication” of musicals, with bells and whistles becoming ever more fantastic and complex, is absent here. Scenic Design by David Korins consists of wooden platforms and staircases on three sides, with coiled ropes on railings, and a natural color brick wall in the back that set off the bare stage that uses a turntable to almost invisibly shift people and props. There is no curtain. The stage is framed by wooden beams. The play tableau in Act Two is a case in point of this simplicity, yet total effectiveness of the concept. 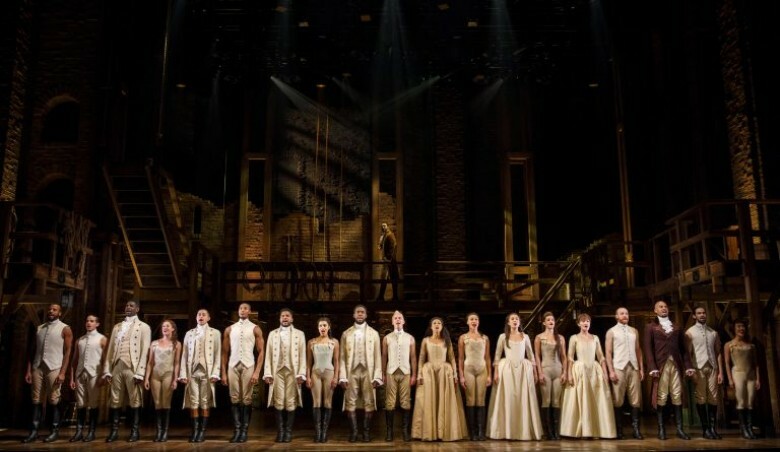 A couple looking at each other dramatically stand in front of several people in chairs, while Mr. Eacker sits in his box, which consists of a few chairs on the platform above, when Philip Hamilton confronts him for disrespecting his father. Simple and complete. That is part of the beauty of Hamilton. There is no fat in the book, the music or the lyrics by Lin-Manuel Miranda, nor is there in the production directed by Thomas Kail. The Orchestrations by Alex Lacamoire never overwhelm the singers. Mr. Miranda’s words perfectly meld the personal and the political. Each character is clearly defined, their strengths, weaknesses and desires clearly stated. He uses curse words sparingly, which make them all the more effective. His characters may burst into complex rhyming punctuated by dance moves and intense energy, or sing quiet and reflective, yet powerful, ballads. The choreography by Andy Blankenbuehler fascinates. It is impossible to see everything the ensemble is engaged in at any one moment. Props appear and vanish on the bare stage as if by magic, transported by the dancers in a ballet that is entirely in synch with the action on stage. As John Laurens, expertly portrayed by Jon Viktor Corpuz, and the ensemble sing “Rise Up” in the production number My Shot, each person carries a chair, a table, or a box, raising it high so that the energy and meaning of the song are enhanced by the movement of the dancers. Every element is choreographed for maximum effect. The dancers at times freeze in place as the turntable circles around, creating marvelous, painting-like images. The lighting by Howell Binkley creates moods in blue, purple, and red, while the spare use of spotlights intensifies dramatic mood. Costumes are by Paul Tazewell. The tights and body suits worn by the ensemble hint at the period, but allow for maximum movement and appreciation of the images they create. 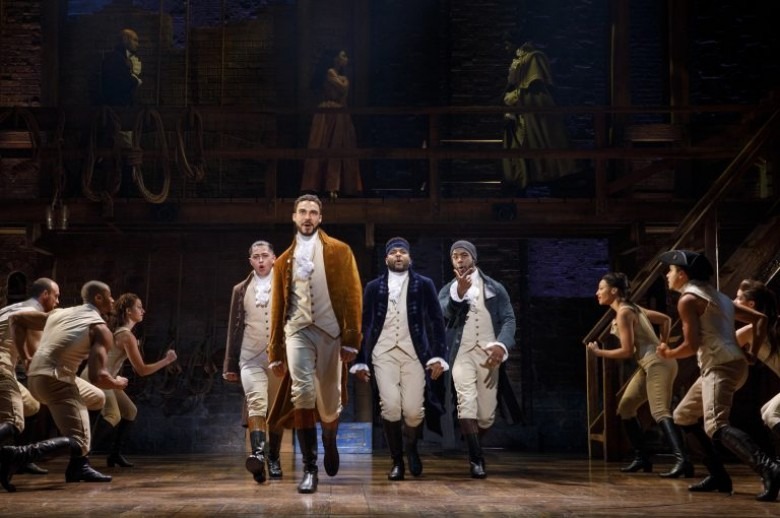 Austin Scott’s Hamilton, while well-acted, does not have the feel of someone who, just like his country, is “young, scrappy, and hungry.” I expected more juice from him, more brashness to hide his insecurities, and more of a sense of being driven, which would have underscored his eventual self-destruction and made it even more tragic. Bryson Bruce, who plays Thomas Jefferson (and Lafayette), rocks the combination of rhyme and dance. He is a ball of energy, always moving, cocksure of himself and his superiority to the immigrant Hamilton. He is full of surprises. Understudy Alexander Ferguson played Aaron Burr in the production I saw. He is excellent in his role of MC to the audience, and frenemy to Hamilton. His reticence to stand out that hides his desire for power—to “be in the room where it happens”—is very well played, as is his eventual rage at Hamilton. Paul Oakley Stovall expertly carries the stature of George Washington. Peter Matthew Smith is a hoot as the foppish King George. Comic relief par excellence. And then there are the ladies. Hannah Cruz as Eliza Hamilton is terrific in her lament Burn, after Alexander releases The Reynolds Pamphlet. Her broken heart and wounded soul are on display for all to see. She brought tears to my eyes as she held nothing back. Stephanie Umoh is equally strong as her older sister, Angelica, whose number, Satisfied, speaks to her sacrifice and the drive she shares with Alexander. Ms. Umoh personifies the brilliant woman who is restrained by the culture from fulfilling her own desires, both personal and political, and must be content with “proximity to power.” These are not mindless maidens in search of husbands. Both are smart, strong characters, loyal to each other, and the two women playing them are excellent. Hamilton lives up to all the hype. I would see this musical again and again and hope to have that opportunity. There is so much happening on stage that it is impossible to take it all in at one sitting, while at the same time none of it is extraneous. Hamilton entertains, educates, and just plain thrills throughout. I love it. I hope you get to see it if you have not already had that pleasure. It will be at Shea's until December 9th, and there are tickets to be had.